SeniorsAloud: RICH OR HAPPY - WHY NOT BOTH? Yesterday I received a call from my bank. It seems my very modest investment in a unit trust fund has tripled in value over a period of 10+ years. Great news indeed till I read in the Straits Times today Forbes latest list of Singapore's wealthiest people. 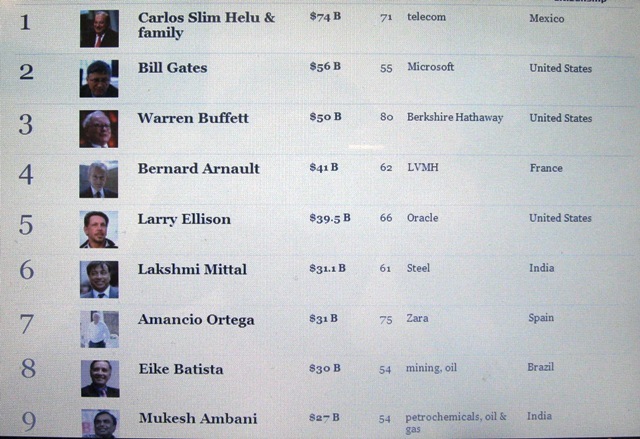 Some of these individuals have doubled their wealth in BILLIONS in just ONE year. The richest ﻿Singaporean is Wee Cho Yaw, 82, chairman of United Overseas bank, and for Malaysia it is Sugar King, Robert Kuok, 87. They are worth USD4.2 billion and USD12.5 billion respectively. 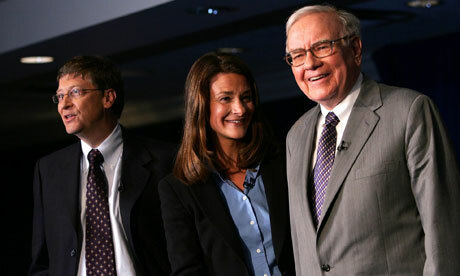 Compare their wealth with the richest man on this planet, Carlos Slim, 71, who is worth an astronomical USD74 billion. 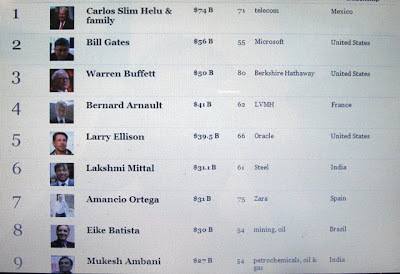 Forbes 2011 list of the world's richest people. The majority of these wealthy individuals in Singapore and Malaysia made their money in real estate, hotels, petrochemicals, retail, banking and telecommunications. Indeed, it's a very diversified investment portfolio for many of these billionaires. It takes money to make money. So the rich get richer. But then again, not all these billionaires started off rich. Apart from those who inherited their wealth, there are those who have put in years of toil and sweat to get to where they are now. These are the people who inspire the rest of us, and show us that dreams can come true provided we keep our focus. 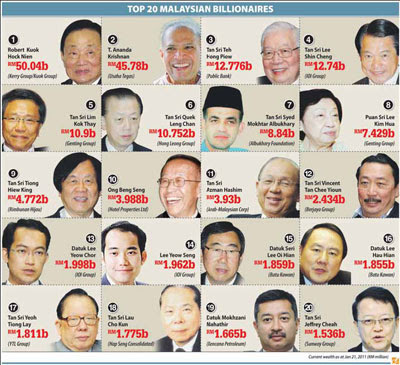 Singapore billionaire Sam Goi, 62, is one of these self-made billionaires. Known as the "Popiah King", his company produces 35 million pieces of popiah skins a day, exported to 49 countries worldwide. His net worth: USD1.2 billion. If it's all about hard work, vision and passion, there's hope for the rest of us yet to make it to our country's list of wealthiest people. Any takers for exporting wantan skin? 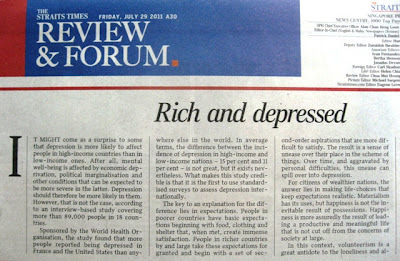 But it's not all peachy and rosy for the rich, if you read the editorial in the Straits Times today. The rich have their problems as well, and depression is one of them. In a separate news article, a WHO-sponsored study covering more than 89,000 people in 18 countries reported that more people in rich countries like France and the US suffer from depression compared to those in poorer countries. 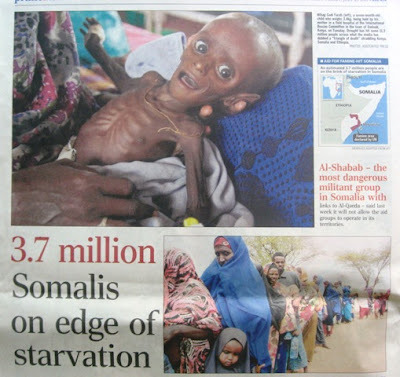 The explanation given is that people in poor countries have basic needs e.g. food and shelter, which, when met, create immense satisfaction. People in rich countries, however, have needs that are more difficult to satisfy. Their money and material possessions do not always bring them happiness. When happiness eludes them, the result is depression and loneliness. 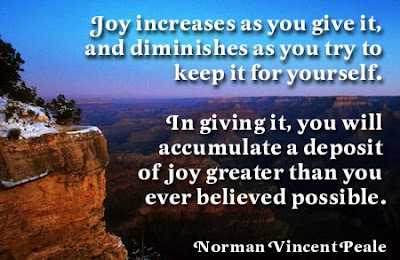 The most effective antidote for the rich but depressed is volunteerism. Helping others, says the study, gives the rich an opportunity to give back to society the money they have made from the people. It is a way to rid themselves of that guilt feeling, for how can they sleep in peace knowing that millions of their fellow human beings are dying from starvation or living from hand to mouth? Warren Buffet, 80, with his fortune of more than USD50 billion, knows this. He has vouched to give away most of his fortune, and is using peer pressure to get as many of his billionaire friends to follow suit. 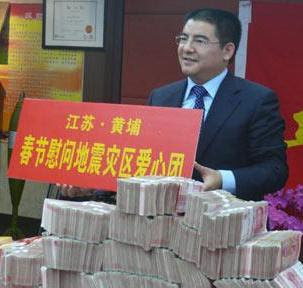 He was recently in China to encourage the newly-minted billionaires there to do likewise. You can be the world's richest man or woman, but when the end comes, you have to leave everything behind. Death is the great equalizer of us all, the rich and the poor. Can our billionaires spare a thought for the elderly? This is a great, well formatted and easy to understand post with useful information, keep it up and keep writing this way. "I will link it back to your website though. If this is a problem please let me know and I will take it down right away" "
"In some parts of the world, the word apartment refers to a new purpose built self contained residential unit in a building, whereas the word flat means a converted self contained unit in an older building. An industrial, warehouse, or commercial space converted to an apartment is commonly called a loft, although some modern lofts are built by design. Thanks a lot. Regards"